Liptember Hoop-a-thon: Koshigaya Park will host a fun hoop workshop this Sunday to raise money and awareness for women’s mental health issues. It seems campaigns that raise awareness for mental health are everywhere today. The need to break down the stigma surrounding mental health issues is at the core of campaigns such as Liptember, Are You Ok Day and Suicide Prevention Day, all of which overlapped last week. The importance of these campaigns is of no surprise when statistics propose that 45 per cent of people will experience a mental health condition in their lifetime. When Ingleburn resident, Natalie Wadwell discovered that suicide is the biggest cause of death for women between 18 and 34, she was spurred to gather a team and join Liptember’s campaign. Liptember is a national campaign to raise awareness for research specific to women’s mental health. Miss Wadwell’s team “For Her’’ is endeavouring to raise $600 and an increased awareness for women’s mental health. They have reached the halfway mark and want to take the campaign to the public. This Sunday, September 27, 2015 you are invited to participate in their Liptember Hoop-a-thon in Koshigaya Park, Campbelltown. Between 1 and 4pm, there will be hula hooping activities in the park for people of all ages. From 1-2pm, the public can participate in a hooping workshop with Amanda of Lupa’s Hoop Pit. Participants will learn the basics of keeping a hoop up and some fun tricks to get you hooping all summer long. Participation is $5 and is strictly limited. To avoid disappointment reserve your spot by emailing wadwellinitiatives@gmail.com with the subject line ‘I’ll Hoop For Her’. Following this a two hour hoop-a-thon will take place. Participants can practice their new tricks to music and hoop the afternoon away. Participation is $10 and subject to hoop availability. All participation costs are donations to Liptember. Why hooping? It is the childhood pastime that unlocked our imagination and brought much joy which was left in the school yard. Is it making a comeback? Did it ever really go away? “As I undertook my research project, I came to understand how my body responded to stress,’’ Miss Wadwell said. 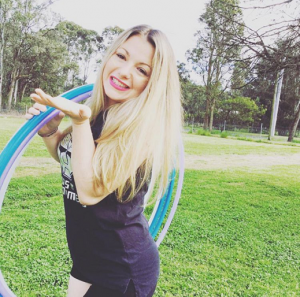 “Taking hooping classes with Lupa’s Hoop Pit helped me to maintain balance, get fit and meet new people. Lupa’s Hoop Pit has been running local classes across the region, including the Mount Annan Botanic Gardens. She says that “not only is this plastic circle a great form of exercise that brings you improved physical fitness, it provides a very important step for improving your brain health and cognitive awareness. The statistics on women’s mental health are staggering, which is why Wadwell Initiatives has partnered with some amazing women, Liptember and Lupa’s Hoop Pit to help break down the stigma around mental health. “I know some women who all speak openly about their experiences with mental health,’’ Miss Wadwell said. “I would like to see the conversations we have become normalised within all social circles.